5 – Post it and invite your friends to join in. Oh, c’mon, Sarah! 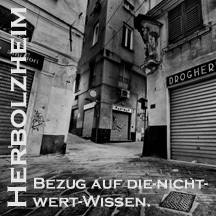 “Herbolzheim” is an awesome band name … think German untz-untz techno-beatbox music. Going to the random quote page, the quote fragment I got was “terms of the-not-worth-knowing” which Google Translate says is “Bezug auf die-nicht-wert-Wissen” in German. How perfect is that? Look! All fun and games until you get a cease and desist. Is there an easy way to filter the flickr selection to a useful creative commons license? Change the “20090217” to the YYYYMMDD for 7 days ago. This search returns all CC-licensed photos that can be used for derivative works, posted after the date specified, sorted by interestingness. The results aren’t nearly as nice as the Explore/Interesting results – the better photographers don’t CC-license their work, it seems – but, it’s still good enough. No joke, I just tried the wikipedia link and got ‘autofellacio’. Ugh. I remember seeing this in RR. I would have tried doing it, but it seems rather long-winded. As in, I’m too lazy.